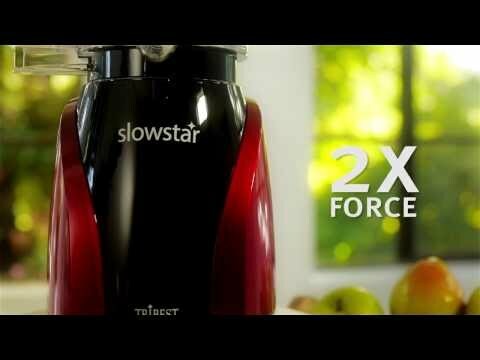 Tribest SlowStar vertical masticating juicer looks fantastic on your counter-top attractive without taking a lot of space and it is easy on your wallet with its mid-level price tag. It is a perfect juice extractor for those who live in cozy homes and apartments with limited counter or storage space. Mincing attachments add more versatility and function and could replace other single used appliances as well. Slowstar small size packs about 50% more power in its motor than other machines in the same price range. In terms of daily use, this means it can squeeze a lot of juice from almost any piece of produce you have without giving you a hassle. Higher juicing yield is one of the major advantages of masticating juicers and Tribest upright delivers with its slow steady grinding auger. And the slow action doesn’t mix oxygen into your juice which means you have lower oxidation levels, more nutrients, and longer shelf life. Is Tribest and American Company? Yes, an American company operating n Anaheim, California with manufacturing located in South Korea. Can you make coconut milk with it? Just crack open the coconut, clean it, cut it into small pieces and place it in the Slowstar and watch the delicious coconut milk flow. Can it fit under my cabinets? At 19.75” with the plunger, it fits on most counter tops and under most cabinets. This is where the answers are not as clear because the term BPA Free is often misused. Follow this link for more details.